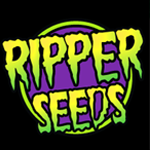 Ripper Seeds - Brain Cake. Free US delivery. Directly from Oregon, one of the most “hyped” cuts to date. Descendant of Face-Off OG and OGKB. This hybrid S1 of Do-si-dos will delight lovers of the most compelling flavors. Braincake is 60% sativa and grows with quite large distances between the internodes. Despite this its yields can be surprisingly large when it is allowed to grow into a big plant. Indoors flowering will take 60 - 65 days following a 2 - 4 week period of vegetative growth. Its buds are of medium size but dense with it and they can form contiguous runs to produce some large colas. Yields are high and it provides smokers with a potent and intoxicating effect. Its flowering time varies up to 65 days forming medium-sized but very compact flowers, with large calyces and short pistils.